Protein Sourced - 9g. Great for pre & post exercise, on-the-go, or with a cuppa. Natural ingredients. Gluten Free. 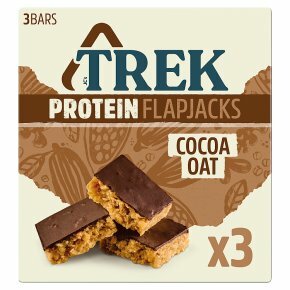 Proudly vegan.Trek Cocoa Oat flapjacks is Trek Original Oat covered with a top layer of chocolate flavour, transforming the humble oatiness into a deep and satisfying taste. The bitter-sweetness of the cocoa perfectly compliments the wholesome flavour of the oats to create something truly special with a taste that stays with you long after the last crumb has disappeared.